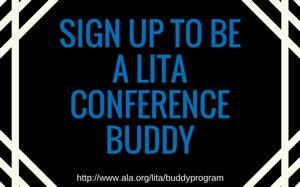 Applications are now open for LITA’s Conference Buddy program for ALA Midwinter 2018. The program is designed to make conference attendance more approachable, foster inclusion, and build connections. Inspired by the GLBTRT Buddy Program, we hope that this program will help us to foster stronger relationships among LITA members who attend conferences and also make attendance more enjoyable and rewarding for everyone who participates. To participate in the program as either a new or experienced conference attendee, get details and complete the sign up form by January 15, 2018. 2018, ALA Midwinter Meetings. permalink.